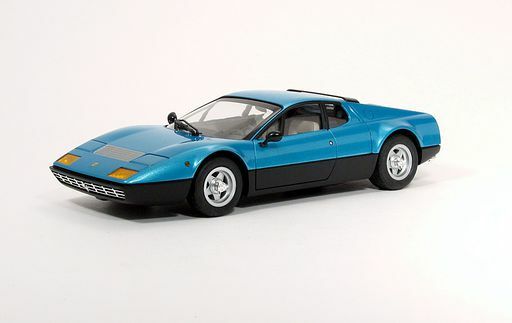 Model Cars | Robert Downie | Fotki.com, photo and video sharing made easy. Welly 1/24 GT3RS refinish job. 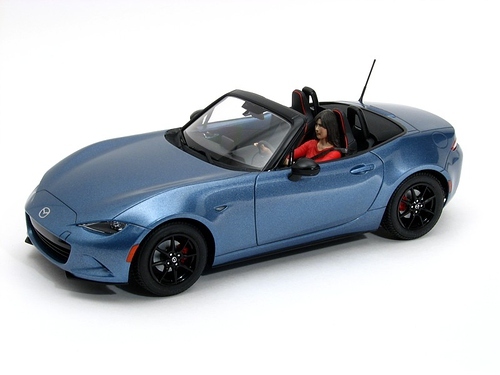 The basic model is very nice for a $20 diecast; opening features are precise, steerable wheels, fixed calipers with rotors that rotate inside them with the wheels, even has door glass. Aside from adding .030" styrene half round to the leading edge of the doors, it'll be just wet sanded and refinished in Porsche paint-to-sample Rubystone Red. Assembled model shown with it; it will get the same treatment in a different color after I've learned everything from this one. Fujimi's 365 GT4 BB built out-of-box with Tokyo Marui 512BB wheels. Paint is Cobra Colors (Lamborghini!) Blu Sirena. Finally building Tamiya's 959...with a few tweaks. 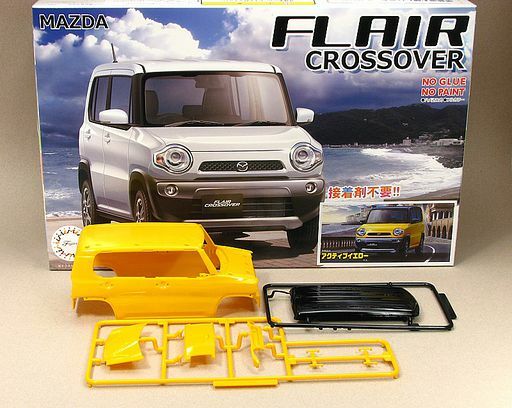 Fujimi Mazda Flair; will be built during the 13th annual 24 hour build taking place during the 24 hours of Daytona. Tamiya model, painted Pontiac Solar Gold. Prepainted kit; it's a fun quick slump-buster, the painting is high-quality and all parts are painted that need painting. 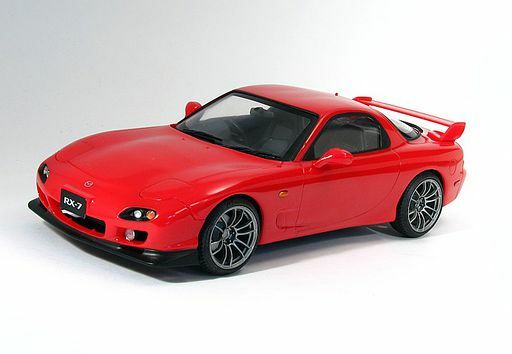 Tons of extra parts from various issues of various previous RX7 kits from Aoshima. Aoshima Gram Lights 57Xtreme wheels/tires in place of stock 5 spokes. Vintage Monogram kit. Very simple model with few parts, but it's an old favorite. The body lines are pretty good and it's a US model. A bit of a slump buster, the most difficult thing will be masking for all the exterior black trim. I have a set of Fujimi Fuchs wheels from a curbside 911 kit that I'll use as the Monogram wheels/tires are a bit small. Older build; fresh shots. Polar Lights kit painted Cobra Colors Legend Lime. 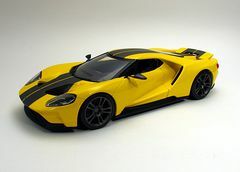 In anticipation of Tamiya's pending '18 Ford GT that was just announced and appearing late January '19. 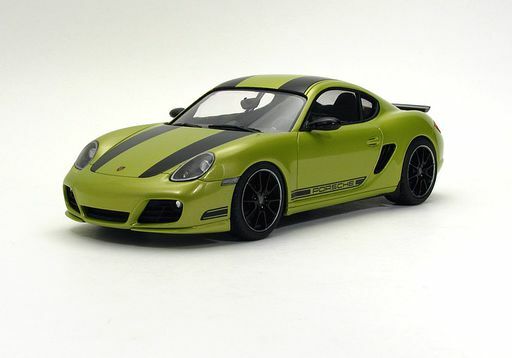 C1 Models Cayman R transkit for Fujimi Porsche Cayman. Paint is factory matched Peridot Green. Fresh photos of my R&D Unique Edsel Model 40 Speedster. One of my favorite models of one of my favorite cars; it was a staple at the Amelia Island Concours d'Elegance for many years. I had planned to make a resin master w/help from Rik Hoving, but along came R&D Unique who generously gave me one of the first copies of the kit for sending him a bunch of research photos to master the kit. 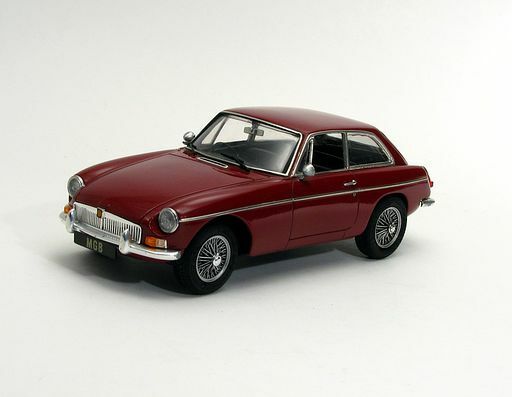 Wish I had another kit, I'd like to make one or two more...the car restored as it is today, and also the first version with the narrower grille which I think looks much better but was updated due to cooling issues. Project finished for Scale Auto December 2018 issue. Revell kit modified for more detail. It was fun taking a really basic toylike "model" and making it look good. Since the article published I replaced the Bullitt wheels (which I'm not a fan of on the 1:1) with a set of Maisto Boss 302 wheels that I like much better and part of the Mustang family. 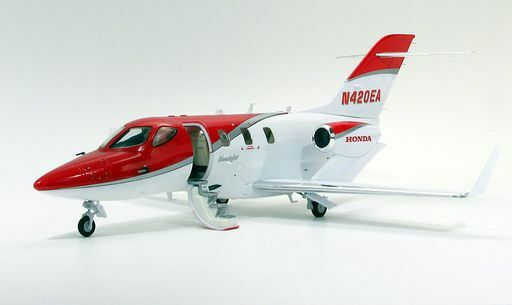 Ebbro's new HondaJet. Review model for Fine Scale Modeler. Nice kit! Revell Bronco turned into an offroad/Baja style model. In the June '18 Scale Auto magazine. Just received this new kit from Modelers. 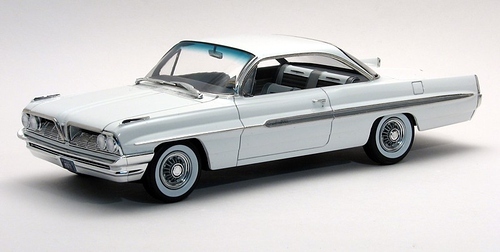 Modelhaus Merchero resin kit. Wheels from Z-Man. I added Colony Park style woodgrain panels (Evergreen strips for the frame), and will have a matching surfboard soon. Fun project! Woodgrain decals were designed from online patterns that were adjusted for color and then printed for the sides and the bed floor. The bed floor ended up printed on paper, sealed with Krylon Crystal Clear, and photoetch bed strips from Detail Master were added. Some fresh photos of an older build. 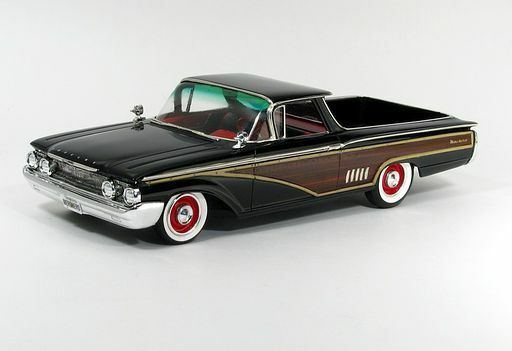 It's the Modelhaus custom chopped '58 Edsel, patterned after a local custom Edsel built in the early 90's. At the time it was one of my favorite cars ever; the real car was teal. As is the case with most '90's era customs and street rods, the tastes of the time look very dated by today's standards. The monochromatic paint, the pastel colors, the 3 spoke billet wheels...if I were to build a similar car today it would get some of its chrome back and more appropriate wheels that hopefully will stand the test of time more appropriately. But this is pretty cool, a snapshot in time, and the model itself has held up remarkably well. 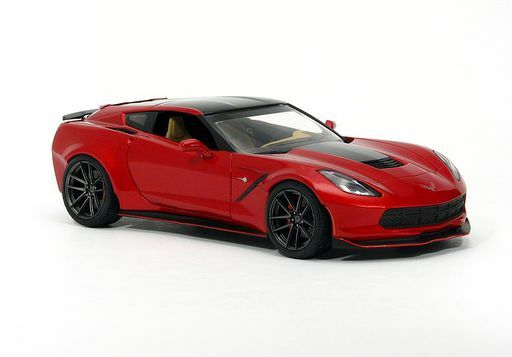 Combination of Revell C7 glue kit with C1 Models Callaway Aerowagon and Trufiber conversion kits. Fun project! I blended the Trufiber fenders in rather than leaving them with the "tacked on" appearance. Restoring an old Tamiya facelift SA22C aka FB RX7. 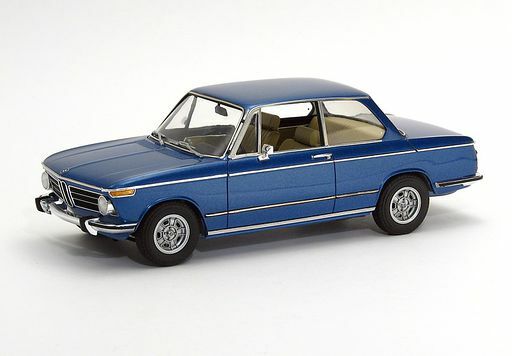 Will use a few parts from the reissued Revell/Monogram kit and custom wheels. Reissue Revell/Monogram kit, being built mostly OOB stock. 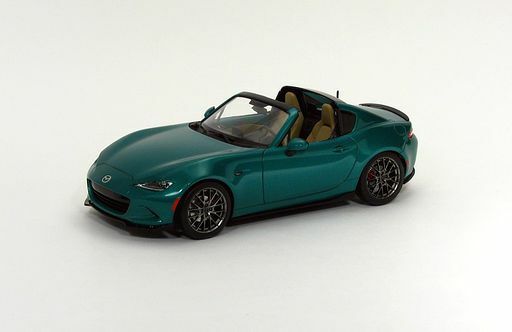 Using a color that mimics the original RX7 green (that was not available in the US), with a base tan interior and steel wheels. Wheels/tires from a Fujimi KPGC10 Skyline GT-R parts pack. This is my build of the reissued Monogram RX-7 "Cafe Racer"; now in Revell 2 'n 1 stock or race configuration. Review model for Scale Auto. I upgraded the wheels/tires using a set of Fujimi Watanabe racing wheels with slicks, and masked/painted extra sections of the red striping livery that were missing from the decal sheet. Photos 6-12 show the model with the kit based wheels and tires prior to adding the aftermarket wheels/tires, and the final two photos show the race version with a stock version I built in the late '90's, as the stock version is also included in the box and builds quite nicely itself. 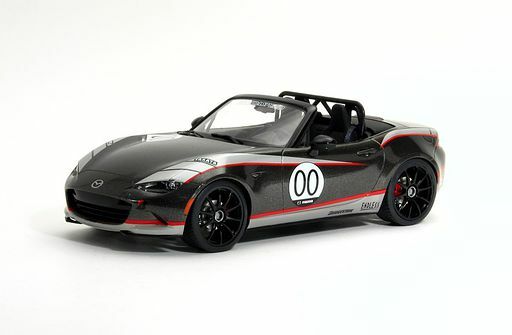 Quick build of Tamiya's MX5 using Studio27's Japanese inter series decal sheet for the MX5. Stripes are similar to Mazda's presentation Global Cup racer. This is a street going tribute car, just to have some fun and try to get it finished during the 24 hours of LeMans. Revell kit, built out-of-box for review. 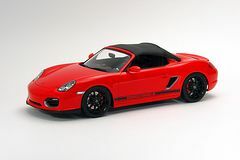 C1 Models resin transkit for the Fujimi Porsche Cayman; KA Cayman detail set used for brakes and seatbelt hardware, mirror faces, etc. Paint is Tamiya TS-86 Pure Red. 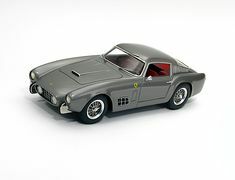 1956 Ferrari 250 TDF "14 Louver"
1/24th scale kit from Historic Racing Miniatures; based on a previous MG Models kit from Japan. Built mostly out of box, will add Hasegawa wire wheels (from 250 TR) and photoetch wipers. This is a very basic curbside resin kit, using a color scheme inspired by other similar 50's Ferraris. 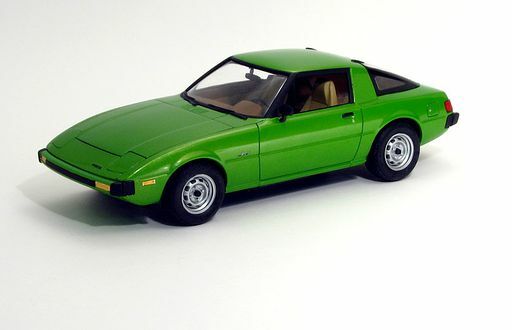 As far as I know, none of the 9 14 louver cars were painted in this color scheme; but with hindsight this is the color scheme I would have ordered for the car at the time it was produced. Fun project, very different from working with a standard plastic kit. Restoration of a built Honda 1300 Coupe9; finished photos first followed by pictures as-found prior to restoration and a few in-progress photos. Found this 25-30 years ago in Toledo for about $10 sitting among a bunch of expensive dealer promos from a vendor that was right next to the Modelhaus. 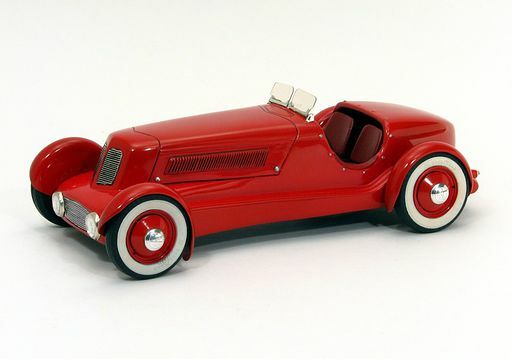 I was hoping to find more similar oddball Japanese models like this, I have never seen another one of these since. This was a fun, quick restoration. I left the nearly generic interior as-is, as well as the chassis. I detail painted the wheels with silver, Molotow chrome, and Tamiya black wash.
Hasegawa kit; out-of-box build. Inspired by the history and seeing one in person at the Petersen Museum. Revell 918 Weissach w/Plamoz wheels and custom Brumos graphics; decals and painted. 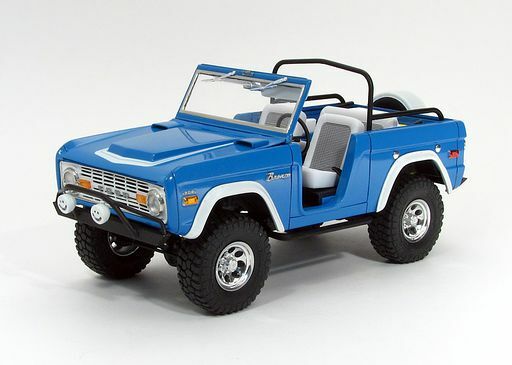 Revell's new Bronco; built for expanded review in April 2017 Scale Auto. Shown here with Moebius Ford F100 wheels and tires that replaced the undersize kit wheels and wheelcovers. 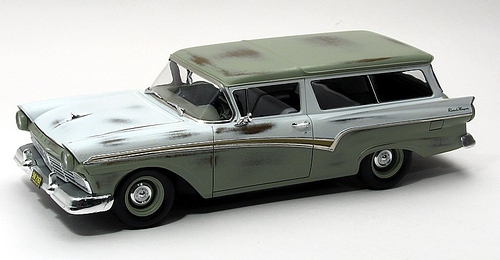 If you want bone stock this is a good look; Fireball Modelworks has stepped up and offers properly sized steel wheels, tires, and wheelcovers to replace the Revell wheels (kit wheels are 13" diameter in scale; should be 15" in scale). AMT original annual kit; paid $8 for it in the '90's. Added woodgrain panels and the basketweave interior by making the digital artwork and printing on a color laser printer on clear decal film. Mirrors from the parts box, the happy face antenna ball is from a pinhead. 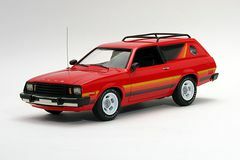 Reissue of MPC 1979 Pinto Cruising Wagon. 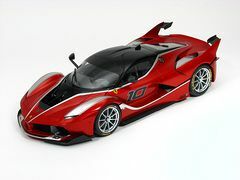 Tamiya's new FXX-K model. Expanded review in the October 2016 issue of Scale Auto Magazine. 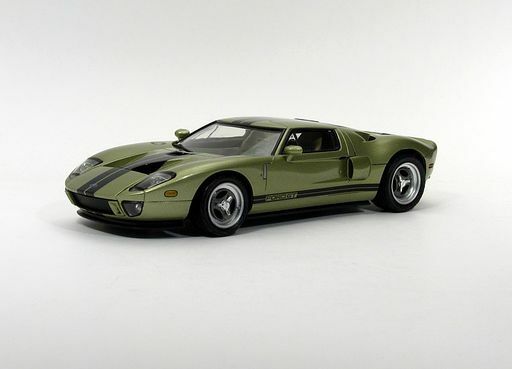 Revell's new snap-kit Ford GT. I planned to build several; the first one was to get acquainted with the model itself, a second and a third were built together, the third being a yellow version for an upcoming article on how I added detail to these simple kits. A very simple snap kit to begin with, but with a very complex body requiring a good bit of work to get it cleaned up and painted/detailed nicely. The plan for the first build was to paint it to match the white GT shown at the auto shows this year, but later I decided to add silver stripes and the silver wheels. 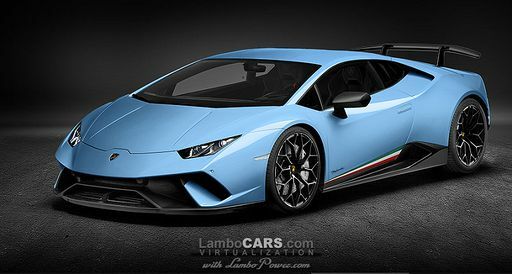 The gray version is more evocative of modern paint schemes seen on Lamborghini, Ferrari, Corvette, even the Focus RS, and the lower blue stripe was inspired by the Lamborghini Veneno. 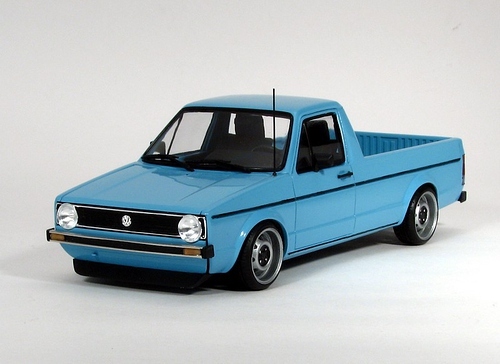 C1 Models transkit for Revell's new-tool Golf GTI or Rabbit kit. Wheels are ATS Cup from Clearly Scale. 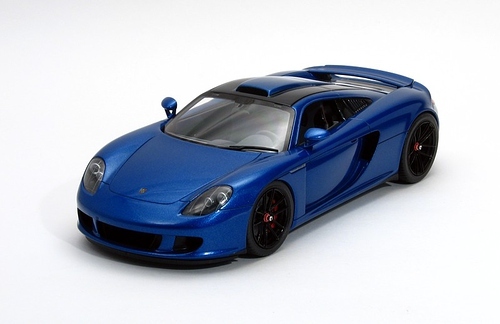 Tamiya Porsche Carrera GT with Revell 911 GT1 roof. Started 11 years ago, just finished. Mostly OOB build of the new Moebius kit. It looks good, but don't let the looks fool you. This is a skill level 5 kit with a lot of fit issues. Do not paint this model until you have test-fit everything...especially the glass. If you expect a kit that falls together, this isn't it. If you like the Ventura and have decent building skills, by all means get this model, just don't expect to cut any corners or expect a dazzling finished model in a short timeframe. Revell's Del Rio built as a sleeper using 2013 Boss 302 engine and drivetrain. Fun build, weathered, built for Scale Auto article in the April 2016 issue. This is the Revell Build 'N Play snap kit that I built for use as the trophy for ACME's 2015 "Web Theme" for the 50th anniversary of the Mustang. Fun/quick build; Gunze gold, Pegasus sleeves/tires, XS Tuning wheel centers, rendered headlight decals. Mirrors/rear spoiler from a diecast parts car. Less than 10 hours total work. Originally painted red enamel w/a failed Glosscote clear in 1995, and put back in box for 20 years. Resurrected recently, I stripped the red paint, primed and painted the body with a mixture of Testors Daytona Yellow & Wimbledon White lacquers to emulate T5R yellow. Wheels are Fujimi AVS Model 5 on cast Fujimi brakes. Ride height lowered. 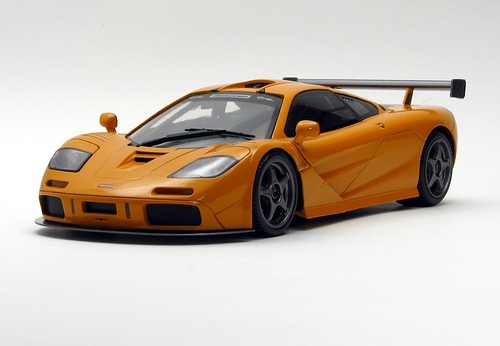 Fujimi's McLaren F1 LM kit. Not the greatest kit in the world, but it's the only plastic F1 LM there is. 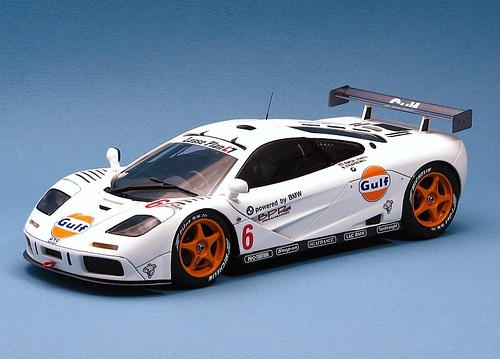 Model of the white #6 Gulf livery run at Paul Ricard 4 hour race in 1996. 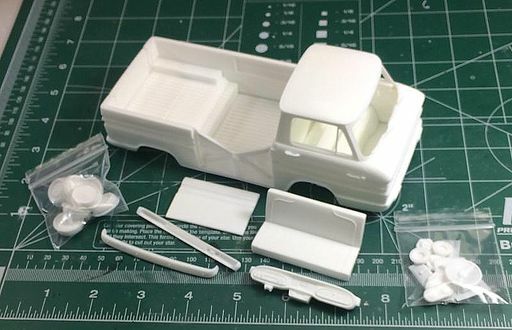 Fujimi kit with Tabu decals. Fujimi #24 Gulf McLaren short tail. Finished a few days after the 24 hours of LeMans 2015. TS 89 over a black base, Titanium Silver accents, Tabu decals (Fujimi Gulf logos/stripes were red, not orange). Revised side skirts, lowered suspension. Revell's recent snap kit Raptor; painted in a mixture of two Gunze solvent-based colors to approximate the factory desert tan "Terrain" color. A lot of masking ahead for gray and black trim. Academy Hyundai Azera/Grandeur with a couple twists. I rescribed most panel lines as they were extremely weak, and painted it a custom color using a dark gray base and metallic orange paint (decanted Tamiya TS paints). Wheels are from Revell's 2015 Mustang GT, painted steel gray and detailed with Rub 'n Buff. Because the grille and a few other details are "Grandeur" and not Azera, I decided to build it with the Korean market Grandeur emblems. Reshots of my custom Mach III Coupe Concept. Reshots of Tamiya Z car I built in previously. Aoshima Aventador Roadster built for review. Decided it was time to build my first McLaren F1 kit. This is Fujimi's street version. It's a decent curbside kit w/a few minor issues, and Fujimi has just announced the first pair of short tail racing F1's so I figured I'd get this one knocked out to learn the ins & outs of the kit. I have two Fujimi long tail racers, Aoshima has outdone Fujimi on the longtails, but I'm holding out hope Aoshima does the short tail (racers, F1 LM Homologation special, stock). I'm going to keep this as simple as possible, I have Fujimi's upgraded set of photoetch and a few other parts, and used non-stock wheels, but with a twist, they're from a Tamiya 360 Modena. Paint is Testors Honduras Maroon overcoated with a layer of transparent orange, then clearcoated with U-Pol. Revell's LaFerrari. I have one of the very few Revell AG kits to come into the country, but built the Revell US kit. Word to the wise, go online to Revell AG's (Revell Germany) website and get the instruction manual for their version of the kit, it's far better than the US version. This kit looks great finished, it was not very fun to build since there was so much tedious bodywork required to fill sink marks, remove mold lines, and to properly mold in the side coves. If you can't afford the Tamiya version but want a LaFerrari, this is the kit for you. Revell's new '67 Camaro SS built OOB. Paint is Tamiya Titanium Gold. 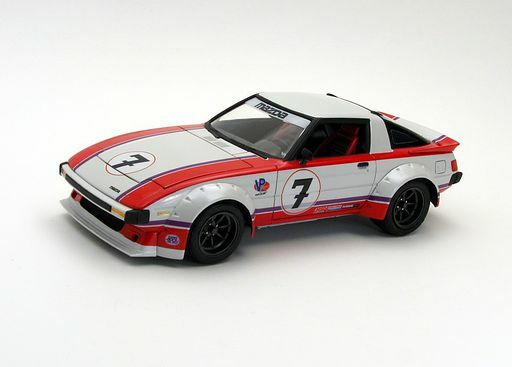 Tamiya's recent modified reissue of their original Fairlady 240ZG kit. New features include racing seats and parts from the rally kit, and some new Watanabe wheels and some side draft carburetors. Photos by Eric Cole. Some photos of a couple GT40's I built (my #3 and #6 Gulf), and some photos of my #3 GT40 w/Eric's #1 Mk IV. We built the red GT40's for our 2014 LeMans palooza group build. 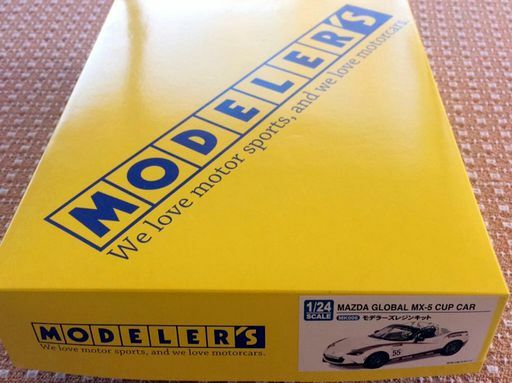 Won the Auto Show Edition 2015 from Revell, decided to take the very simple promo-like kit and personalize it. I thought about a Mach I, found some images on the 'net, and came up with a relatively simple plan. Read about the conversion in the Aug. 2014 issue of Scale Auto. Paint is MCW 1969 Ford Mustang Silver Jade. Before I added the blackout details, it sure looked a lot like an Aston Martin! 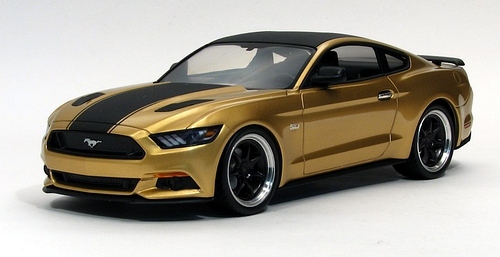 Fun project for such a dead-simple model, good shelf material until we get a full-detail kit of the all-new Mustang. Finished LeMans Palooza 2014 Ford GT40 Mk II #3. Used a vintage Fujimi/Revell #98 kit as the basis. Painted Tamiya Italian Red, cleared w/U-Pol. Decals are Shunko's excellent brand-new decals for the #3, the sheet also has #2 and #6, though they incorrectly show the #6 car as red. Very fun model to build! Model was prepped ahead of time for the 24 hour build. Parts were prepped/painted. The idea is to have fun, finish the model and have a nice model at the end, so we aren't picky about forcing the entire car to be started & finished in 24 hours. The real race cars are prepped ahead of time in order to have the best chance of finishing and winning. Can't wait for next year! Mild restoration of a built model; I bought the model a week ago at a model show already built (builder unknown). Paint was very rough, it had a rough basecoat of white, decals were decent and under a rough coat of clear, so I saved them by wetsanding the existing clear and applying many coats of clear, with much wet sanding between coats to get it presentable. It's far from perfect, but it's a model I'd been wanting to build and didn't even know this kit with this livery (very rare kit, Tokyo Marui kit) existed in the first place. It's a nice shelf model now w/the paintwork and some detailing. Hoping to build the #53 car in the future. Revell 2013 Mustang Boss 302 kit. Color is Tamiya TS34 Camel Yellow. OOB for the most part, lowered 1/16" front and rear. RMR resin kit. Neat subject, lots of TLC required. Revell had a surprise release at the NAIAS aka Detroit Auto Show; a snap-together 2015 Mustang GT offered to "kids of all ages" at a make & take. I correctly guessed "Mustang" on Revell's Facebook page, and they sent me one of these new kits. They'll be available soon in the regular make & take program. Neat model, very simple construction, the epitome of the old "Promo" model. 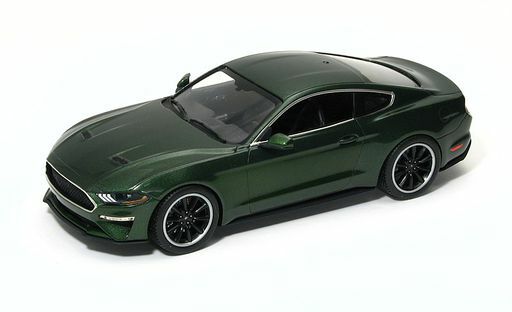 Now hoping for more detailed kits of the new Mustang. This is a big deal, Revell has a kit out before the public can buy the new car. Revell 599 GTO, built out of box. 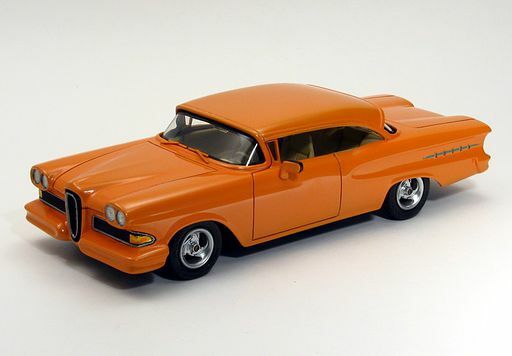 Mild custom '55 Chrysler 300. Fujimi's new Ferrari F12berlinetta kit, built (quickly) OOB. This was a bit of a practice build, to see what was what, I'll spend more time tweaking/detailing the DX version that's coming soon. Overall a decent kit, with the typical corner-cutting known to Fujimi as of late. This started as a "Full View" clear-bodied LFA for review. I built the clear body, installed it on the finished interior/chassis of my previously built LFA, shot a few photos, and then proceeded to take the body apart and prep it for paint. This is a cool kit, I'm not much for gimmicks like the clear body. I went with Tamiya Mica Red for the paint finish, under multiple coats of U-Pol clear. I resisted the urge to paint the roof and wheels black. I'm pleased with the results. Tamiya VW Beetle built as a Volksrod; inspired by Hank Young's Volksrod, I used my own color scheme and VW suspension and wheels rather than vintage Ford. The Polar Lights Herbie closed fabric roof is mounted on it. Headlights from Phantom Vickie, rear tires are vintage Monogram 1/24 whitewalls (insert painted black), front tires are Hasegawa Beetle as they are slightly smaller than the Tamiya tires, for a better stance. Taillights are former stock front fender vents. Exhaust is a combination of solder and some repurposed metal intake horns purchased from Kenny Shores/Bandit Resins. This was an immensely fun project, it managed to take Best In Show at the CKM NNL on August 18th, 2012 where I had entered it in their special VW theme class. I still need to revise the front suspension and steering. Tamiya's new Toyota 86 model. This is the RHD JDM home-market car that the Scion FR-S is based upon, as well as the Subaru BRZ. Like the real car, some upgrades have already been made after the original build for Scale Auto review. Namely, lowering it slightly, and installing AVS Model 5 wheels. Paint is Acryl Cobalt Blue (mixed w/acetone and a few drops of retarder), overcoated w/U-Pol clear. Testors gloss black lacquer applied to the roof. Neat kit, easy to build. This is my annual LeMans palooza build. Roughly 16 hours of work, very simple Tamiya kit based on a Tamtech remote control body that is molded in white with integrally molded windows (in clear). Windows were masked for painting the body. Mostly OOB, but I did utilize a set of Porsche 959 headlight lenses and buckets, and I also cut out the rear spoiler insert so I could easily remove the mold line on the decklid area and finish the unfinished panel lines around the corners of the spoiler. Fun kit, a great choice for a LeMans palooza build. I was done by midnight so I could watch about 4 hours of the race during the night and the last hour or so in the AM. My first built Enzo; it's Revell's new snap kit. Very good kit for a snapper, I gave it a few tweaks above factory stock, and a paint scheme that's a bit more modern than seen in 2003, but one that is familiar to current Ferraris. Testors Chevy engine red lacquer, Tamiya gloss black, cleared w/U-Pol. Photos taken by Scott Laudenslager. Hasegawa kit, built OOB. Pretty nice kit. Paint (decanted and shot through Iwata and Grex airbrushes) is a basecoat of Testors Grabber Orange, overcoated w/clear mixed w/yellow pearl powder, then U-Pol Power Can clear. Revell AG's Citroen 2CV. The kit is a 2CV6 Charleston, I've decontented it a bit to look like a more basic 2CV. Weathered a bit with dull paint and pastels, to give it the look of the real cars I saw in Paris in the '70's. This is a greatkit, detail is pretty impressive. I had fun just building it OOB and paint detailing. Underhood detail is especially nice. A revisit of my earlier "Flashback" which went viral. My original Challenger/Camaro/Mustang combo had the earlier 2005-2009 tail end. When I built it, the 2010 Mustang had been shown, and I really wanted that design. But it wasn't available in scale until nearly 2 years later. I was asked if I had taken photos of the build process for the original model, and I had not taken good enough photos for publication. I did take photos of this new one. I think it is a much better looking model with the new tail end. The 2010 Mustang tail end complements the Camaro roofline especially well, seen from behind. The wheels I had on it at the ACME NNL, 2005 Mustang concept wheels, have been replaced with Maisto 2012 Mustang GT wheels that suit the style a lot better. They were not available when this version was built. I've just finished up a Bandit Resins '72 Gremlin X model, based upon AMT's recently reissued 1976 Gremlin X kit. 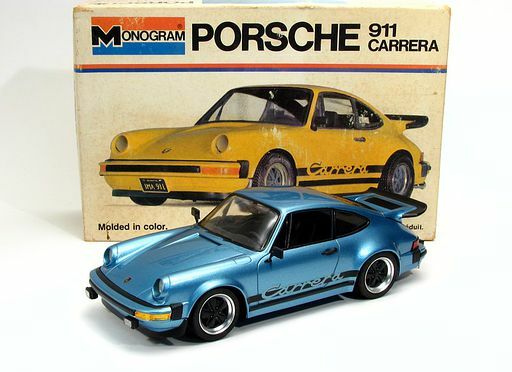 The blue model shown here is an out-of-box original annual kit from 1976, and is pretty much how I bought it in Toledo close to 20 years ago for all of $2. In the meantime I acquired an original box with many of the original parts, including sealed chrome parts, and basically all the parts minus the actual body, hood, and chassis plate. My intention was to restore this Toledo find, but because of the newly reissued kit, it's nice to keep original. If I do decide to restore it, I can build almost an entirely new kit from the extra parts I have, aside from the chassis. I'd call this Toledo model a "sympathetic restoration"; I took it apart when I bought it planning to restore it, but then it sat for years. With the new kit in hand, I decided to put this one back together and clean it up and do a few minor touchups; this was my reference guide and comparison model for the new buildup of the '72 Bandit Resins kit that utilized the guts of the reissue. The original builder did a nice job; spray painted and clearcoated, silver trim, accurate detail painting on the exterior. The interior is just one color (same as exterior), the the chassis is all black, the engine block painted red. Neat model, and inspiration for the new one that was just finished. Revell's snap kit Mustang GT convertible conversion; built with the glue kit engine and chassis to make it full-detail. Revell GT 500 built OOB, only modification was ride height reduction of about 1/16" all around. Revell's Snap Tite kit of the 63 'Vette. I added a few details such as chrome interior/exterior mirrors, antenna, and VRM decals for the emblems and gauges. 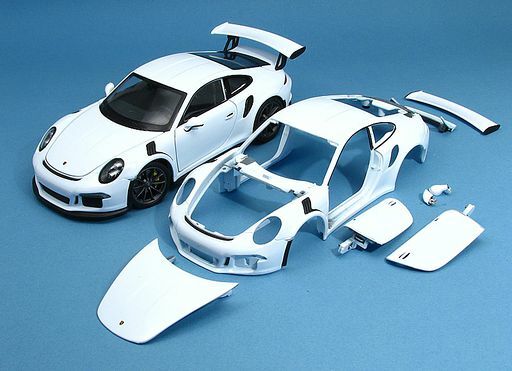 Painted Tamiya German Gray, clearcoated, Studio 27 GT3RS red graphics were applied with the "S" removed. I built it as a privateer track day car. The kit rear spoiler split in half when I tried to remove some poorly-applied carbon decals, so I found a shorter spoiler in the parts box and used the kit uprights and end plates. I may lower the spoiler. Aoshima Mercedes SL65 Black Series kit, built w/the optional photoetch and transfer detail set. Great kit, fun to build, color scheme inspired by seeing one like this on a web search. Tamiya reissued this kit again, and finally offers it in the US. Nice vintage kit with very good detail. 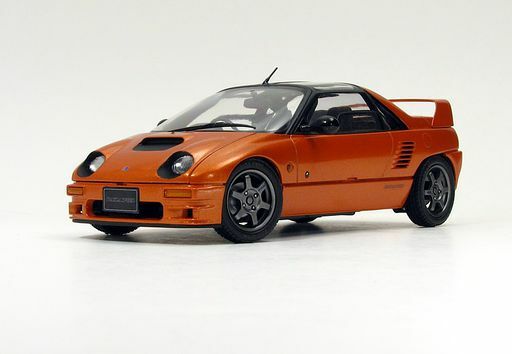 First NSX kit I've built; I may kitbash this model w/the Fujimi 2002 Type R to make it full detail. Aoshima's Countach 5000 QV. This one gave me a lot of trouble due to the fact it had a warped body; because of the opening doors and fragile A pillars, this made it difficult to build w/o the warp being evident, creating a domino-effect of issues. Doors had to be glued in place to help keep the warp from re-occuring from the torsion of the chassis installation. I also had issues w/the fit of the engine compartment and related components, but that may have been self-inflicted. Some big frustrations, but it ends up looking pretty good overall. Too many issues for a kit that retails for $76.00. New Revell kit, review is in the October issue of Scale Auto. Nice kit, aside from the out-of-box "Subaru Outback" inspired tires and ride height. The first two photos show the stock wheels/tires, the other photos show it with a set of Welly 2005 Jaguar XK coupe wheels. They look the business, a factory-esque style appropriate for the Mustang and with better looking tires. I also lowered the ride height. I'm even happier w/the kit with these modifications. Hasegawa Mazda 767B "Finish Line" livery; built during the running of the 24 Hours of LeMans in 2011 during our annual "LeMans Palooza". I pre-painted the body ahead of time due to uncertainty w/the old decals, primarily the canopy decals for the blue section. I scanned them just in case, and used the scan to make templates to mask for the blue paint. I used the kit canopy decals for the pinstripes to finish the edge, and sealed all other decals to make sure they wouldn't disintegrate into the water. Trimming the decals then was a fairly lengthy process, but the decals worked very nicely. Very simple kit, my only issue was with the rear spoiler fit. Neat car, I think it finished 7th in 1990. Fujimi Honda CR-Z built for review in October issue of Scale Auto. 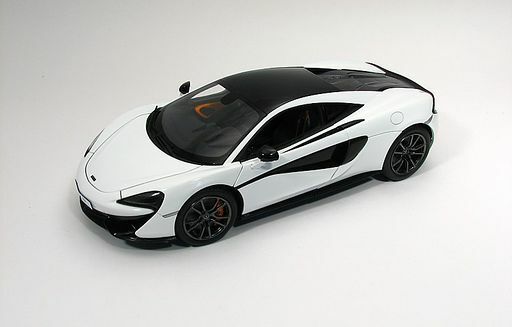 Pretty neat kit, I like the shape of this car, maybe Fujimi will give us the Mugen version? I hated the glass, it's a very tight, overlapping fit into the rear quarter window area, I had to cut away one side to get it to set into place. The interior tub is the new-style/old-style under-detailed tub w/integral side panels and seat cushions. It details out okay, and the finished model looks pretty cool. Trumpeter's new Falcon Sprint, built OOB for review. Sometimes frustrating, some very odd engineering, overpriced by a factor of two, doesn't capture the body shape as well as the crude old annual, yet the crazy thing is it looks really nice finished, even compared to an original kit (I have a built '65). Putting exterior shape aside, the interior, the underhood area (especially with the custom intake and valve covers) and the chassis all have much more detail than the original. I used the custom dual exhaust, it looks far more convincing than the "stock" exhaust which is nowhere near accurate. Unexpected surprise at Wal Mart tonight, I saw a trio of new Taurus Interceptor police cars. There was a white generic highway patrol unit, a black and white generic local unit, and this all-black unit w/o a roof bar. Looks like I might be missing a driver's side spotlight. Neat model for $9.97...it's better than the Greenlight SHO that is nearly $30. Tamiya Lexus LFA. Built OOB for review. Paint is Tamiya Pure White with a pearl white midcoat (using LMG powders). Very nice kit overall, a few minor assembly issues. Stance was perfect the first time, a rarity for a model so complex. Detail level is very nice, though for the price I think they should include seat belt material/hardware and a LHD dash. New photos of an older model that I needed to clean up and replace a cornering lamp. Fujimi Mazdaspeed kit with custom-mixed paint that is a gray tone with a cobalt blue pearl added. Interior is black w/blue seat centers. This is still a work-in-progress, needing more detail in the form of interior screens, equipment, exterior antennae, strobes, license plate, and new decals for the rear side glass that can actually be read. This is a 1/24 scale Magnum R/T "Uptown" kit, doors glued in place, door handles added, wheels/tires/seats from diecast Charger police car. Light bar from Lindberg plastic Charger kit. Decals were designed and printed by me using photos as reference. I've always loved the slightly sinister look of these local police cars and have wanted to build a model for some time now. Hopefully soon I can finish up the other details; it is still a very simple curbside kit. Lindberg's Dodge Charger police car built using my own designed & printed decals. This model will be featured in an expanded magazine review. Great kit, I want to add a few more details. I made my own decals as the aftermarket ones I had were for an older car and the colors were off. These decals were printed on both and Alps printer (the gold backgrounds) and a color laser printer (all the blue). Thankfully they came out very crisp and clean, much nicer than the aftermarket "Chimneyville" decals.